The WBT-4000W is a triac dimmer selling for upwards of $25 on eBay. 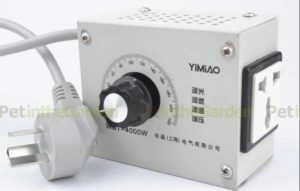 AC 0V-220V continuously adjustable, zero hysteresis, zero latency, superior heat dissipation. The question is, does it deliver these things? The pic raises the first concerns about electrical safety. The plug lacks the insulated live pins required by Australian standards, and the fits-all output socket has gaping holes that would permit accidental contact of foreign bodies with live pins. 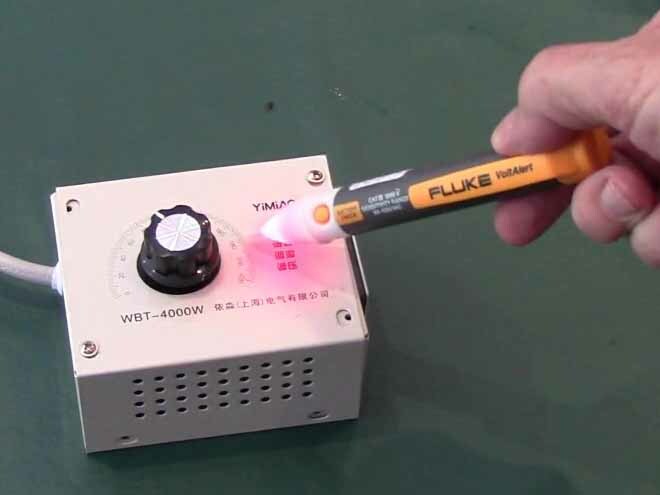 Powering it up, a Fluke non-contact voltage detector glows when held near the metal case, it is probably not grounded, possibly live. Above, removing the case shows the earth wire from the plug cable is connected only to the output socket, it is not connected to the exposed metal case as required. If some insulation inside the device failed, the case may become live without blowing a fuse (as it would if the case was earthed). The device would not pass an Australian Standards appliance test for a Class I appliance, and is therefore unsafe to use. In fact the thing has severe hysteresis. If set to less than 90Vrms out, it will not turn on if the power is cycled. This severely limits its usefulness and shows the product claims to be a fraud. No, it is unsafe and does not deliver the claimed low hysteresis. It is truly a piece of dangerous Chinese junk. A set of modifications was made to make the device safe and to address the severe hysteresis. 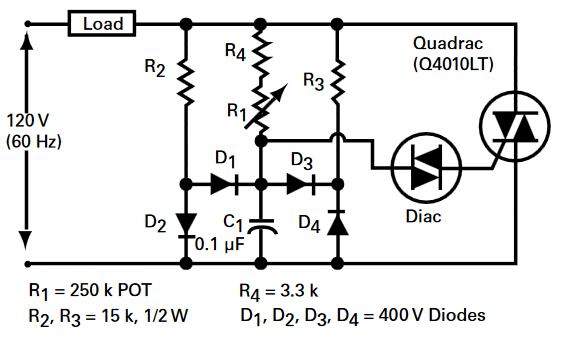 The simple phase control circuit used in the controller has hysteresis or snap-on effect. The cause is that the timing capacitor charge starts from a different voltage depending on whether the diac fired in the previous half cycle. A serious issue with this snap-on effect is that if power is turned off at low power setting and reapplied, the controller may not switch on. The modification used is a variation of the above circuit to suit 230V AC 50Hz. 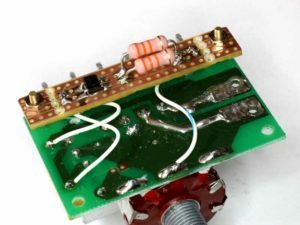 R2 and R3 are 33kΩ 2W resistors and D1-D4 are a MB6S diode bridge, the parts are built on a small piece of Veroboard mounted to the controller’s PCB. Above is the modification. The Veroboard carries two 33kΩ 2W resistors and a MB6S bridge rectifier. It has yet to have the Veroboard tracks opened under the resistors. 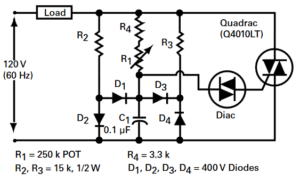 Since the modification quickly drives the trigger capacitor to 0V at the start of each half cycle, the phase delay available with the existing resistors (500K pot) and cap (0.15µF) is less than before the modification, so it does not quite turn down to zero. The panel calibration also changes. This prototype turned down to 32Vrms which is (32/240)^2=1.8% of full power. 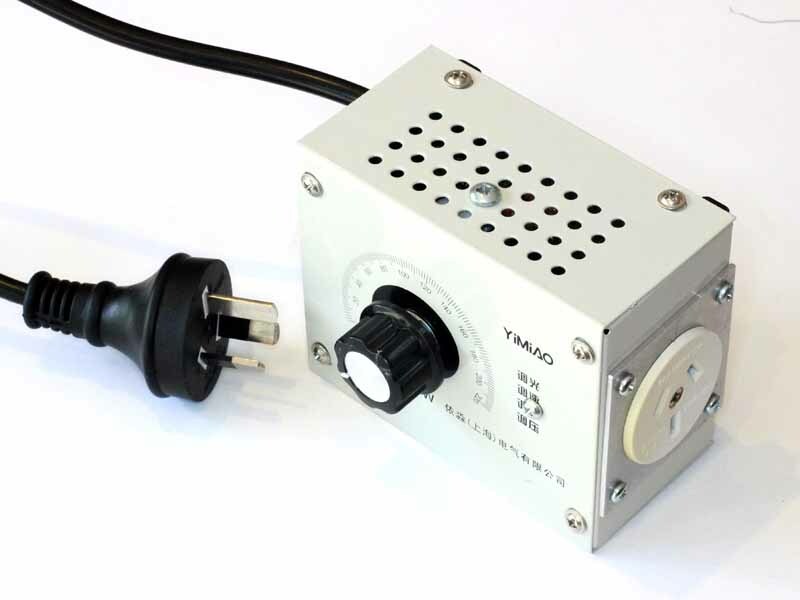 If set to minimum, it switches on reliably at that power level without snap-on effect. If a lower minimum is needed, a 0.047µF X2 capacitor could be paralleled with the existing C1 (a replacement of say 0.22µF will not fit the PCB holes). 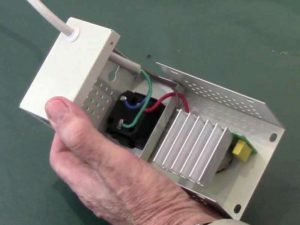 The input cable was replaced, the cable was secured with a P-clip and screw, the output connector was replaced, a washer was placed on the pot shaft to space the PCB live pads awa from the box.